Join the discussion on our forums! 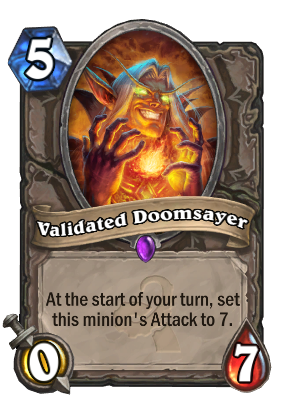 Come discuss Validated Doomsayer over in our dedicated Validated Doomsayer discussion topic. You can either heal him or destroy him for fun. Good in aggressive decks I believe. One large minion does not hurt. sick art I love it. Turns out, it's a pretty ok card. I was wrong, I'll admit it. Aldor Peacekeeper: "Follow the Rules"
I won't miss him piloting those Shredders. I won't miss the Shredders at all. VS Aggro and tempo deck, this will just be 0/7 with soft taunt most the time and get taken down or they just go face since you wasted a turn playing this. VS Priest, they steal it or remove it. VS Warrior, it might work to waste 1 of their removal, but it won't impact the game that much. Compare this with Alarm-o-Bot, is it really worth it? There are more consistent stuff to innervate out for Druid, so even that suggestion isn't so great. Does it's attack reset to 7 every turn? It would be battlecry: at the start of your next turn set this minion's attack to 7. Insane in ramp druid, but unlikely to see play in any other decks. And in Arena, Crazed Alchemist OP. Coin into you'll love my new recipe! So does this mean there will be no doomsayer card in the new expansion?? There will be. Doomsayer is Classic, hence he will never be removed through expansion rotation.